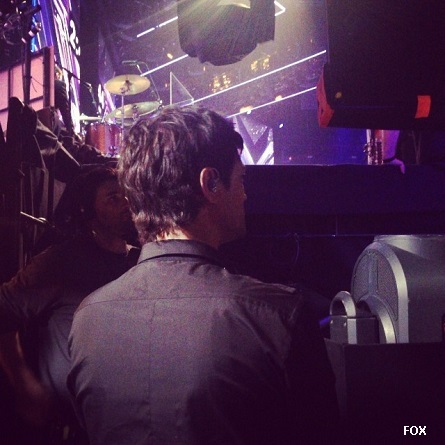 This week’s live performances on The X Factor USA had the artists performing modern songs in a Big Band Style. 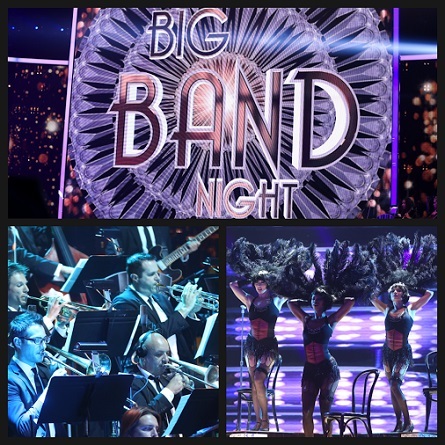 The theme was Big Band, however there were maybe one or two songs that were actually from that era. The country artists in competition – Rion Paige and Restless Road stuck to their country roots while tackling the Big Band vibe. Hosted by Mario Lopez, with mentors Simon Cowell (Groups), Demi Lovato (Girls), Paulina Rubio (Boys), and Kelly Rowland (Over 25s) that never forgot each othes harsh criticisms from last week’s live shows and boy did they remind each other of it this week! Because Wednesday’s live performances are one day before Thanksgiving – in which, ironically, the day that two artists will end up going home on, each mentors’ artists expressed whom they were thankful for. Everyone, except Alex & Sierra who chose themselves, chose a family member. The Top 8 ended the night with a performance in which they were critiqued on. The stand-out artist of the night as labeled by Simon was Ellona Santiago. But, there were many break-throughs that viewers experienced first-hand Wednesday night from Lillie McCloud who finally showed her vocal range; Jeff Gutt, who gave a stellar performance; Josh Levi who was finally able to just have fun; Restless Road who harmonized better than ever; and Carlito Olivero who showed what kind of artist he really is. Of course Rion Paige delivered another knock-out performance as well! Simon asked Jeff last week why he thought he it had not worked-out for him yet in music. Though at the time, Jeff was not allowed to answer due to his mentor’s reaction, Jeff addressed Simon’s question this week, but still didn’t give his answer. Jeff said he’s still not in the place where he thought he’d be in music when he was younger. He put a lot of pressure on himself because he wants all of his sacrifices with being a single father to mean something. Jeff said his Dad is the person that taught him hard work and how to be a Father. He dedicated his performance to his Dad. His Dad visited him and said he was most proud of Jeff when he hears Jeff say that he was doing the competition for his son. 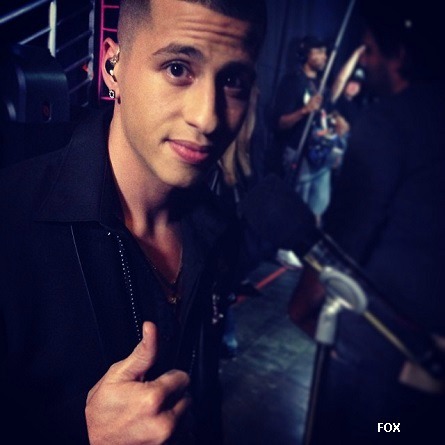 Carlito Olivero – X FACTOR Big Band Week. Last week Carlito was in the bottom two. He said it felt like everyone hates him. His parents, he said, is his biggest inspiration. He’s dedicating his performance to them. Paulina chose a Latin song and had him learn it in Spanish and in English. He performed Ricky Martin’s “La Copa De La Vida” and “Maria”. Josh Levi – X FACTOR Big Band Week. Last week Kelly told Josh to experience more freedom on the stage. He said he wishes that his Grandmother was with him. Josh said it would be the first Thanksgiving without her and he is dedicating his performance to her. His Grandmother visited him and Josh said his performance will be two hundred percent better with her there. Restless Road – X FACTOR Big Band Week. Last week they got criticisms that they were not harmonizing enough from the girl mentors. Simon said it’s much tougher being in a band than being a solo artists. They are all dedicating their performance to Uncle Bill who died in a plane crash. Put Her Diva Hat On! Rion Paige – X FACTOR Big Band Week. Last week her performance went really well and blew everyone away. She said her Mother encourages her to strive for her dreams. She is dedicating her song to her Mom. Rion said having a live band and choreography this week is going to be challenging. Her coach Demi said, “I think it was your best performance.” Simon said “Because she chose the song.” He was making reference to a prior week when he said he’d like for Rion to chose her own song. Demi warned Simon that he has “a lot to look out for.” and “This girl is going to kill your category.” Demi told Rion that she’s thankful for her. Shut-up The Witches of Eastwick! 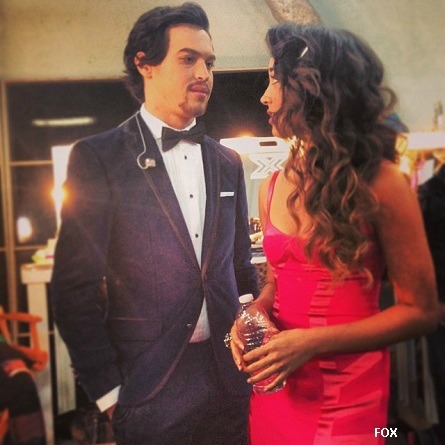 Alex and Sierra – X FACTOR Big Band Week. They dedicated their song to each other. They sang “I Knew You Were Trouble” by Taylor Swift. Sierra wore a long pink gown, and Alex complimented her by wearing a tuxedo and styled, tamed hair. Lillie McCloud – X FACTOR Big Band Week. Last week Simon told her he felt like she arrived! She dedicated her performance to her fiance Terry. She said before she met Terry, she was physically and mentally abused. Ellona Santiago with her niece – X FACTOR Big Band Week. “You’re like a dancing, singing puppet” is what Simon told Ellona last week. She’s dedicating her song to her sister whom she said has been like a second Mom. Her sister, who is fighting cancer, made a surprise visit to Ellona. She said she is continuing to fight and told Ellona to do the same thing. Ellona performed “Mamma Knows Best” by Jessie J. Kelly said, “That was your best performance since you’ve been here.” Paulina said, “I’m a big fan of yours and I love that you are in command. I believe you are a super star,” and told her she is not a Muppet. Simon said “I didn’t say Muppet. I said puppet. That is a game changer. I hope you are going to be here. I hope you loose the dancing because you are an incredible singer. You may have a chance after that performance of winning the show.” Simon sent his love out to her sister. The Top 8 performance was mentored by Michael Buble. They sang “Cry Me a River” which was originally written for Ella Fitzgerald to sing in the 1920s-set film, “Pete Kelly’s Blues” (released 1955), but was dropped. Jeff Gutt said besides Frank Sinatra, Michale Buble is the best they’ve ever had. I’m sure he meant that short of Frank Sinatra, Michael Buble is the next best thing. Buble told the Top 8 that “it’s hugely important that you shine and stand out. It’s a competition.” After their performance, the mentor all commented on it. Yes, The mentors rip them a little bit for a performance that should have been for fun! Demi said, “Ellona you did incredible. Josh, you did a great job and Carlito.” She pointed Lillie out as one of the people that she felt should have given more and should be worried of elimination. Kelly said she only had one line. THE X FACTOR THE RESULTS – Thanksgiving Thursday Night! 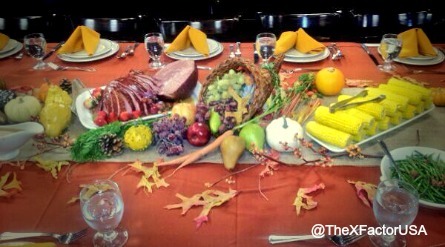 THE X FACTOR USA Thanksgiving day table. Thursday’s Thanksgiving X Factor USA live show opened with the contestants having a Thanksgiving feast together with family members. The Top 8 opened the show with a performance. By the end of the night, the final 8 will become the Top 6. Each Mentor stood next to their artists. 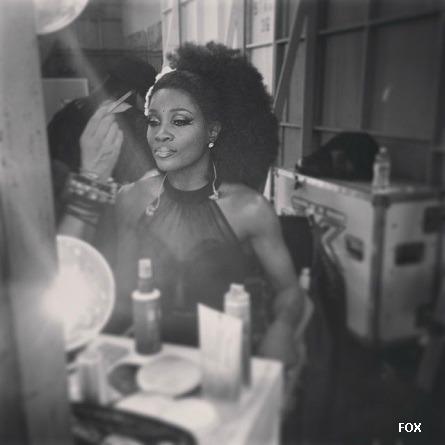 Host Mario Lopez announced that Lillie McCloud was the first act leaving the X Factor USA competition. Lillie said “I’m good, I’m good” and that God knows. She was surprised, yet grateful for competing on the X Factor. Demi Lovato performed “Neon Lights” on the X Factor stage. Her performance was in partial black lighting to display the title of her song. Her lipstick was glowing under the special lighting. The first act that was saved to go through to the Top 6 was Carlito Olivero, followed by Ellona Santiago, then the third act announced was Alex & Sierra. Also coming back to next week’s live shows is Simon’s second and final act Restless Road. 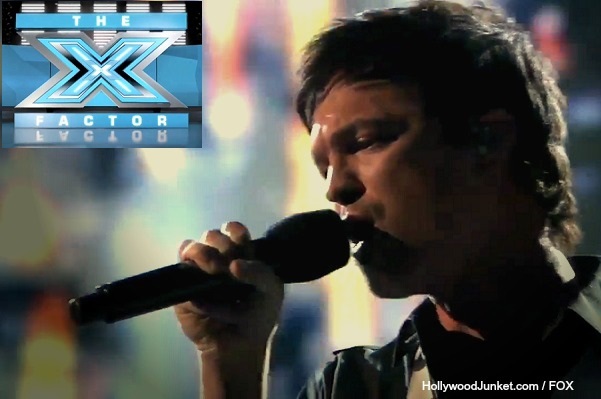 The last act to make it through was Jeff Gutt. The remaining acts, bottom three were: Josh Levi and Rion Paige! They are two of the youngest acts in the competition this season as well as the two of the most talented. Not sure what happened with the voting this week. Maybe fans were too busy leaving town or shopping for their Thanksgiving meals? 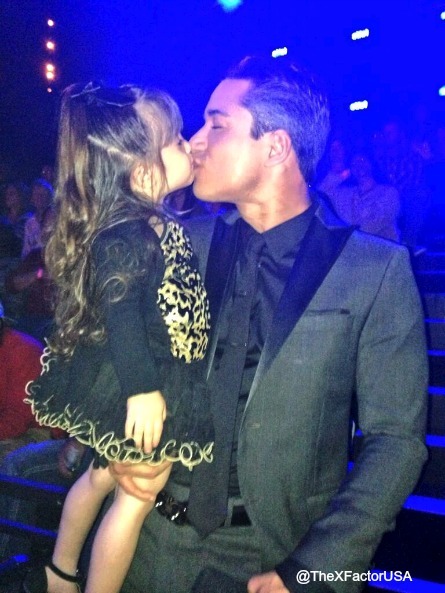 X FACTOR USA host Mario Lopez with daughter. Mario came back from commercial break holding his daughter Franchesca who wished viewers a happy Thanksgiving. Then Michael Buble took to the stage to perform. Rion Paige performed “Pretty Please” for her survival song to gain the mentors votes to come back next week. 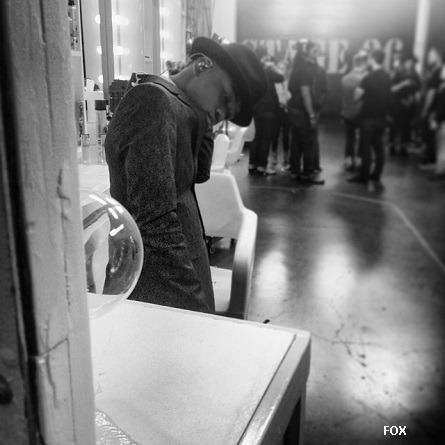 After Paulina announced “Carlito Olivera” for Josh Levi’s entrance to the stage to sing for his survival on the show, Josh sang Bruno Mars’ song “I Should Have Brought You Flowers”. Rion said even though she loves Josh, but is willing to give a fair fight. Josh said he gives everything in his heart on the stage and gave everything that was in him when he came back for a second shot in the competition. Demi said she hates having to eliminate someone on Thanksgiving but the act she voted to send home was Josh Levi. Paulina had to vote as well. She said her act is Josh, but love Rion who “has been on top of everyone else.” She voted for Josh to stay. Kelly who was an impartial judge said it is wonderful to see such young artists who know what that want to be and that each act has grown each week. She told Josh that he needs to remember what it feel like to be in the bottom if he stays. She voted to send home Rion.